Rated: PG-13 for the naughty language often heard on football fields. The great debate on documentaries is often whether the filmmaker is responsible for the quality of the film, or if it is simply the power of what is being filmed. It is somewhat of a moronic debate to say the least (content and style go hand in hand), however, something must be said for documentaries that simply have the camera in the right place at the right time. We can think of the chaos in Gimme Shelter, the insanity of Francis Ford Coppola in Hearts of Darkness, or the stirring funeral speech Ameena Matthews gives in The Interrupters. Undefeated, a documentary about a small town football team that is part sports drama, part coming-of-age tale, certainly falls into the category of the later. I’m not sure what directors Daniel Lindsay and T.J. Martin expected when they turned their cameras toward the fields of Manassas High School, a place of no hope among a poor, predominantly black neighborhood of Memphis. 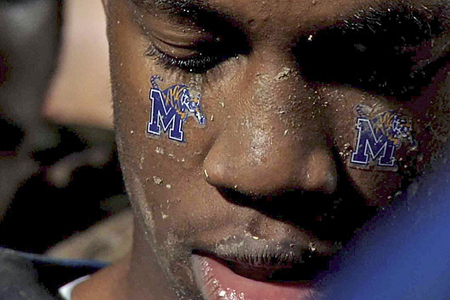 However, after whittling hours upon hours of footage from the school’s unbelievable season, Undefeated has turned into a stirring portrait of discipline and character, and more rousing than most fictional sports movies. Most of that comes from the film’s gravitational center, coach Bill Courtney. Courtney works days as the owner of a wood manufacturer shop and volunteers as coach, becoming the father figure to each one of these boys. 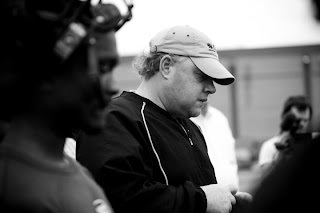 He exclaims early in the film, “Character is not about how we win, but how we handle failure.” And teaching failure seems to be more important to the Coach than any line route, as most of the boys don’t have a chance at playing college, and prison seems inevitable for more than one. Courtney does all he can; after a spat between two players, he drives all the way to the house of one of the boys and teaches him a lesson about putting himself before the team. Lindsay and Martin find the kind of characters you can’t dream up—a player with a chance to play Division 1, a senior with a devastating injury, and one out of the penitentiary and searching for redemption—and they understand the language of the sports underdog film and craft it to their real life footage. Occasionally, this becomes a nuisance; the film feels a bit overproduced when sometime more simplistic, especially given the power of the characters and their real-life narrative, would suffice. There’s also an argument to be made that Lindsay and Martin also avoid many of the larger issues of the area—there’s an acknowledgement of the racial tension in the city (Courtney and his staff are mostly white, while the team is black), and certainly the film’s coda doesn’t hint at the future of the players who may not have the same future as those who do survive. And we never get the sense of the community and the larger issues it is facing; the film hopes football can be the microcosm that speaks to all the issues, but the closed off sports world becomes somewhat of a barrier. Certainly Lindsay and Martin aimed for the sublime art of Steve James’s Hoop Dreams, but part of what made James’s film so unique was how rarely it let us cheer for the game at hand. That, however, is where the power of Undefeated comes from, as a number of scenes that tore my tear ducts apart. Rarely do you see this kind of love between a coach and his players, and letting that translate to the field. I clinched my fist at every touchdown, screamed in agony at every fumble. And then there are the human moments, like when a player returns to the field for the first time and makes a tremendous tackle, proving his worth. When he returns to the sidelines, Courtney smashes him with a hug with a force that could only be described at devastating (and it’s just one of dozens in the film). Undefeated is one of the five films poised to win the Oscar for Best Documentary this weekend, amid controversy that more deserving films like The Interrupters or Senna were not even on the Academy’s shortlist. 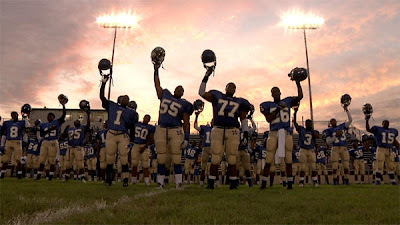 That may be a shame, but Undefeated is the type of film that transcends its sports subject and becomes a powerful coming-age-tale about one man’s attempts to teach boys into men, and put the trust into their hearts that self-worth, discipline, and sacrifice matter in this life. Courtney muses that “football doesn’t build character; it reveals character.” And by turning their cameras toward the small fields of Manasses, Lindsay and Martin find real character in the hearts of these young men. Congrats on your win at the Oscars! I look forward to seeing it soon and hopefully being able to purchase when it is available. My hopes are that it might inspire some of the diversified students I teach in my class.You have much to be proud of accomplishing at such a young age....Keep up the great work!! !